The NASA-led research team, which included Hiroko Beaudoing, a faculty specialist at the University of Maryland’s Earth System Science Interdisciplinary Center (ESSIC), used 14 years of observations from the Gravity Recovery and Climate Experiment (GRACE) mission to track global trends in freshwater in 34 regions around the world. "This is the first time we’ve assessed how freshwater availability is changing, everywhere on Earth, using satellite observations," said Matt Rodell, lead author of the paper and chief of the Hydrological Sciences Laboratory at NASA’s Goddard Space Flight Center. "A key goal was to distinguish shifts in terrestrial water storage caused by natural variability—wet periods and dry periods associated with El Niño and La Niña, for example—from trends related to climate change or human impacts, like pumping groundwater out of an aquifer faster than it is replenished." Freshwater is present in lakes, rivers, soil, snow, groundwater and glacial ice. Its loss in the ice sheets at the poles—attributed to climate change—has implications for sea level rise. On land, it is one of Earth's most essential resources for drinking water and irrigation. While some regions' water supplies are relatively stable, others normally experience increases or decreases. But the current study revealed a new and distressing pattern. 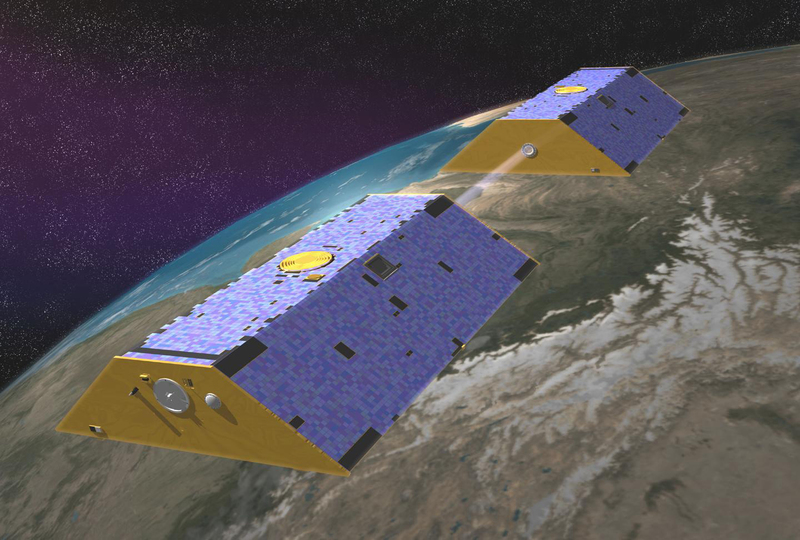 The twin GRACE satellites, launched in 2002 as a joint mission with the German Aerospace Center (DLR), precisely measured the distance between the two satellites to detect changes in Earth's gravity field caused by movements of mass on the planet below. Using this method, GRACE tracked variations in terrestrial water storage on monthly to yearly timescales until its science mission ended in October 2017. However, the GRACE satellite observations alone couldn’t tell Beaudoing, Rodell, Famiglietti and their colleagues what was causing an apparent trend. "We examined information on precipitation, agriculture and groundwater pumping to find a possible explanation for the trends estimated from GRACE," said Beaudoing, who also has a joint appointment at NASA Goddard. One of the big causes of groundwater depletion across the board was agriculture, which can be complicated by natural cycles as seen in California, Famiglietti said. Decreases in freshwater caused by the severe drought from 2007 to 2015 were compounded by groundwater withdrawals to support the farms in the state's Central Valley. Southwestern California lost 4 gigatons of freshwater per year during the same period. A gigaton of water is the equivalent of the mass of water in 400,000 Olympic swimming pools. A majority of California's freshwater comes in the form of rainfall and snow that collects in the Sierra Nevada as snowpack and then is managed through a series of reservoirs as it melts. When natural cycles led to dry years, causing diminished snowpack and surface waters, people relied on groundwater more heavily. Downward trends in freshwater seen in Saudi Arabia also reflect agricultural pressures. From 2002 to 2016, the region lost 6.1 gigatons per year of stored groundwater. Imagery from the Landsat series of satellites shows the growth of irrigated farmland in the arid landscape from 1987 to the present, which explains the increased drawdown. Natural cycles of rainy and dry years can also cause a trend in the 14-year data record that is unlikely to persist, Rodell said. An example is the western Zambezi basin and Okavango Delta, a vital watering hole for wildlife in northern Botswana. In this region, terrestrial water storage increased at an average rate of 29 gigatons per year from 2002 to 2016. This wet period during the GRACE mission followed at least two decades of dryness. Rodell believes this is a case of natural variability that occurs over decades in this region of Africa. The researchers found that a combination of natural and human pressures can lead to complex scenarios in some regions. Previously undocumented water declines occurred in northwestern China in Xin Jiang province. This region, about the size of Kansas, is bordered by Kazakhstan to the west and the Taklamakan desert to the south and encompasses the central portion of the Tien Shan Mountains. Rodell and his colleagues had to piece together multiple factors to explain the disappearance of 5.5 gigatons of terrestrial water storage per year in Xin Jiang Province. Less rainfall was not the culprit. Additions to surface water were also occurring from climate change-induced glacier melt and the pumping of groundwater out of coal mines. But these additions were more than offset by depletions caused by an increase in water consumption for the irrigation of cropland and evaporation of river water from the desert floor. The successor to GRACE, called GRACE Follow-On, a joint mission with the German Research Centre for Geosciences (GFZ), is at Vandenberg Air Force Base in California undergoing final preparations for launch. This release was adapted from text provided by NASA’s Goddard Space Flight Center. The research paper, “Emerging Trends in Global Freshwater Availability,” Matthew Rodell, James Famiglietti, David Wiese, J.T. Reager, Hiroko Beaudoing, Felix Landerer and Min-Hui Lo, was published in the journal Nature on May 17, 2018. This work was supported by NASA, the University of California Office of the President and the Ministry of Science and Technology, Taiwan. The content of this article does not necessarily reflect the views of these organizations.